HersheyPark, who has been rather quiet on the topic of the 2014 season has finally spoken up. It looks like the park will be getting three new ride additions and two new food options in the upcoming season! 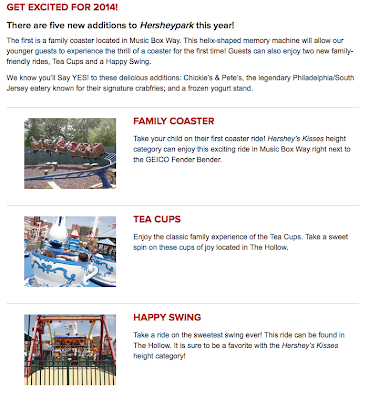 Coming to "The Hollow" we'll see the addition of a Tea Cups and Happy Swing family rides. Both appear to be fairly stock options but it is unknown right now if they'll receive a special "Hersheys" themed make-over. A 'Family Coaster' which appears to be an off-the-shelf model will be making it way into "Music Box Way" allowing younger riders to enjoy some thrills. Again, no real information about this ride but it appears to be a stock kiddie coaster. Also coming in the 2014 season, Chickie & Petes (A Philadelphia Tradition) as well as a new Frozen Yogurt stand. No information yet about the location of these two new food options as they haven't yet been added to the parks website.